Can OfficeWriter 3 or ExcelWriter 6 run on a 64-bit OS? OfficeWriter version 3.x includes ExcelWriter version 6.x and WordWriter version 3.x. OfficeWriter v3.x is no longer supported, and upgrading to the current version is highly recommended. However, if for some reason you need to use version 3.x on a 64-bit system, this article provides all the information you need. If your application is ASP.NET, whether it is using the pure .NET objects or the wrapper classes, you will need to install the 64-bit version of the J# runtime before running the OfficeWriter installer. OfficeWriter 3.x had a dependency on J#. This was removed in version 4. You can get the 64-bit J# redistributable here. Note that the version of J# must match the version of the .NET framework you are using for your application. Microsoft has deprecated J# and there is no version of J# later than 2.0. If your application is ASP.NET, make sure the 64-bit J# runtime is installed. See step 2 above. You must be using OfficeWriter in a custom application rather than in SQL Server Reporting Services. A 32-bit dll cannot run in a 64-bit process. 64-bit SSRS does not have an option to set it to run in 32-bit mode. Therefore in order to use OfficeWriter in 64-bit SSRS, you must use version 3.9.1 or above. OfficeWriter SSRS Integration allows users to generate OfficeWriter output from RDLs in Report Manager. 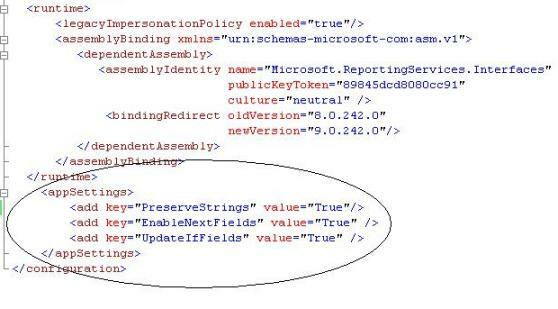 To enhance the level of customization that SSRS integration provides, users are able to set ExcelTemplate and WordTemplate properties by adding keys to specific configuration files. This article will describe how to enable supported ExcelTemplate and WordTemplate properties in SSRS. Please note that these properties are global: they will apply to OfficeWriter output generated by every report in Report Manager. To see what ExcelTemplate properties are supported in SSRS, visit this link. One possibility for generating reports from RDLs is to click on the RDL in report manager and export the RDL to ExcelWriter or WordWriter formats. SSRS subscriptions allow reports to be generated from RDLs to a fileshare or delivered to users via e-mail on a schedule. However, it is important to note that SSRS subscriptions run in a different context and process from the rest of SSRS. The result is that you will need to add your property keys to a different configuration file for subscriptions than you will for generating reports on the fly. Open the configuration file you would like to modify. See above for which configuration file will enable the functionality you desire. You can add properties for reports generated on-demand, by subscription, or both. Inside of the appSettings tags, add your keys in the <add key=”[KEY NAME]” value=”[VALUE]” /> format. The COM version of OfficeWriter has been deprecated. However, some customers have existing applications that use the ExcelWriter and WordWriter COM dlls. The officially supported versions of OfficeWriter (v8.x and v9.x) no longer include the COM dlls. The latest versions of the COM dlls are ExcelWriter 7.6.1 and WordWriter 4.6.1. The last automated installer which contained the COM dlls was OfficeWriter version 4.5.1. One of the most important things to know is that OfficeWriter’s COM dlls are 32-bit. If you are migrating an existing application to a 64-bit server, any application using OfficeWriter COM will need to be assigned to a 32-bit application pool. This article provides more information about the points mentioned above, as well as anything else you may need to know about using OfficeWriter COM. How do I know if my application is using OfficeWriter COM? What functionality is included in the COM version of OfficeWriter? If your application is classic ASP, it is obviously using the COM dlls. But there is another possible scenario. If you have an ASP.NET application using a very old version of ExcelWriter, your application may have a dependency on the ExcelWriter COM dll. This is because before the pure .NET version of ExcelWriter was released, we provided a .NET wrapper for the COM version. Note: If you are using OfficeWriter in .NET, we highly recommend migrating your code to use the pure .NET objects which are fully supported, more up-to-date, and fully 64-bit compatible. If you see a reference to “SAEXCELLib” rather than SoftArtisans.ExcelWriter, your developers probably imported the ExcelWriter COM dll into a .NET project rather than using our custom .NET wrapper. The .NET framework will create a default wrapper if a COM dll is imported into a .NET project in Visual Studio. WordWriter is a pure .NET product with a COM-callable wrapper (CCW) provided for use with classic ASP. The CCW includes only the WordTemplate object. If you are using WordWriter in classic ASP, all the template-based functionality is available. However, since 4.6.1 was the last release, the COM version does not include any fixes or enhancements added to later versions. See the OfficeWriter change log to determine which new features and fixes were introduced after 4.6.1 and therefore are not included in WordWriter COM. OfficeWriter version 4.5.1 was the last public release that included COM dlls in the installation package. It includes ExcelWriter 7.5.1 COM and WordWriter 4.5.1 COM. The latest versions of the COM dlls, ExcelWriter 7.6.1 and WordWriter 4.6.1, are available by request for customers with an active support contract. This request may be made using regular support channels. Note: If you are planning to do a manual installation, you will also need a copy of LicenseManager.exe v4 or above in order to enter your OfficeWriter v4 (or ExcelWriter v7) license key. LicenseManager.exe is included in the automated installer package, or you can request a copy from Support together with your request for the COM dlls. If you are using ExcelWriter COM through the interop in an ASP.NET application, there is no up-to-date documentation available for this configuration. However, there are some resources in older versions of the documentation that may be helpful. Installation instructions can also be found in the ExcelWriter v4 documentation. or you can request a copy of LicenseManager from SoftArtisans support. In versions 4.5.1 and below, the OfficeWriter installer will register the COM dll automatically, but it won’t be the newest version of the dll. If you have an installer for v4.5.1 or below, one option is to run the installer and then copy over the newer dll and register it. That way you will have the full program folder in addition to the dlls. Instructions for installing WordWriter for ASP can also be found in the WordWriter v4 documentation. The COM-callable wrapper (CCW), WordTemplateCCW.dll, is a COM object that makes internal calls to the WordWriter .NET assembly. Therefore, to use WordWriter in ASP, all of the system requirements for running WordWriter in ASP.NET must also be satisfied. Put the WordWriter .NET assembly “SoftArtisans.OfficeWriter.WordWriter.dll “ in the GAC. SoftArtisans.OfficeWriter.WordWriter.dll is a .NET assembly. The CCW allows you to use the .NET WordTemplate object from ASP. The assembly must be installed in the Global Assembly Cache (GAC) to allow the CCW to work. On versions of Windows prior to Windows 2008 or Windows 7, copy the file “SoftArtisans.OfficeWriter.WordWriter.dll” to C:\WINDOWS\Assembly. On Windows 7 or Windows 2008 and above, use gacutil.exe. Unless you have Visual Studio installed on the machine (which most servers do not), you may need to download the Windows SDK to get a copy of gacutil.exe. The WordWriter .NET assembly is compiled with /anycpu and can run natively on 64-bit operating systems. However the CCW dll is 32-bit and must run in a 32-bit process.If your server is 64-bit, assign your virtual application to an application pool that is set to run in 32-bit compatability mode. OfficeWriter version 9 is now available! Here is a breakdown of what you can find in the latest version of OfficeWriter. OfficeWriter version 9 kicks off with the initial release of the calculation engine for ExcelWriter. Now you can evaluate the formulas in your XLSX and XLSM files before delivering spreadsheets. Applications that can’t evaluate formulas, such as mobile apps, Outlook preview, or Excel in protected view, will show the updated values when workbooks are opened. You can also use the calculation engine to update formulas before reading them with ExcelApplication. Currently, the calculation engine supports evaluating all of the formulas in a given workbook through the method Workbook.CalculateFormulas. This will update all the cell values based on the formulas. Check out our list of the formulas that the calculation engine supports. If there’s a formula you need that we don’t have yet, contact our support team to submit a request! The PowerPointWriter beta program has been going strong, and we’re excited for the official release. 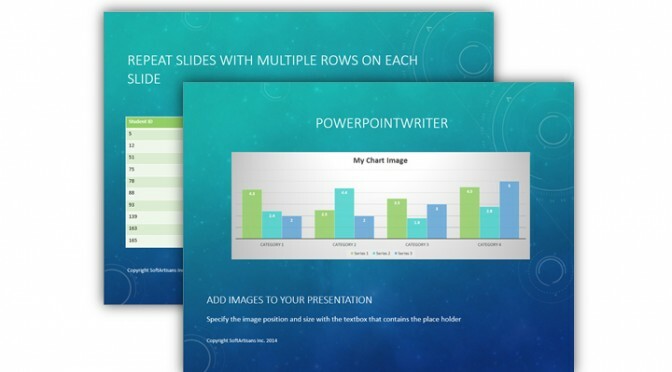 PowerPointWriter introduces a template-based approach to generating PowerPoint presentations (PPTX) dynamically. 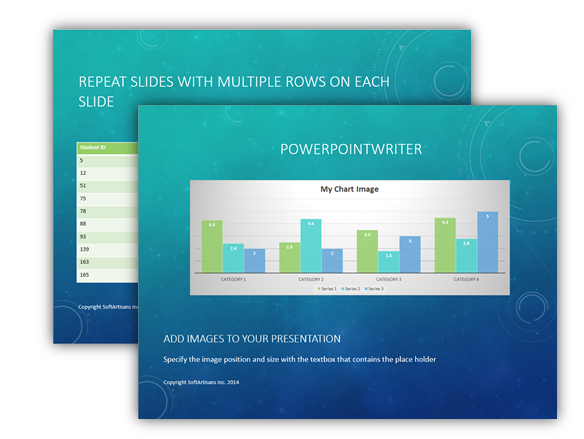 Taking the best principles from ExcelWriter and WordWriter, PowerPointWriter is flexible and easy to learn. Learn more about what PowerPointWriter can do for you with our Features overview, use cases, and API Introduction and Tutorials. ExcelWriter now offers the same protection options as Excel that change how a worksheet is locked down when it’s protected. 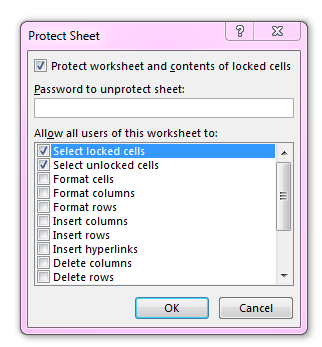 Set SheetProtection properties to customize what users can interact with after Worksheet.Protect is called. Check out our knowledge base article for more on how to use this new feature! In OfficeWriter version 9 ExcelTemplate supports the ability to bind lists of custom objects to templates. For example, you have some custom Order objects that contain information about OrderID, DeliveryDate, PurchaseAmount, and CustomerID. These Order objects are in a list called ListOfOrders. In your template, you can reference the object properties in the data marker: %%=ListOfOrders.OrderID. ExcelWriter will treat each object in the list as though it were a row of data in a table. For more information about how ExcelWriter imports data, please visit our documentation: ExcelWriter Basic Tutorials. For more information about additional information about all of the changes in OfficeWriter, see our Change Log.